Atlus has shared the opening movie to Persona Q2: New Cinema Labyrinth, the follow-up to 2014's Nintendo 3DS crossover dungeon-crawling RPG from the makers of Etrian Odyssey that throws in characters from Persona 3, Persona 4, and now Persona 5. 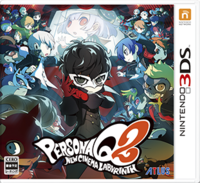 Persona Q2: New Cinema Labyrinth is scheduled to be released for the Nintendo 3DS in Japan on November 29. There has been no word on a western localization as of this time.